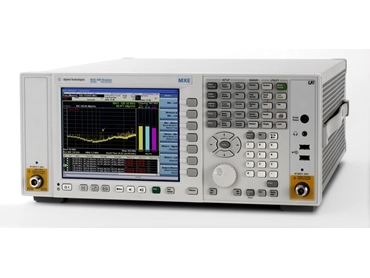 Agilent Technologies introduces the N9038A MXE EMI receivers designed for laboratories that perform compliance testing of electrical and electronic products. The N9038A MXE EMI receivers enhance electromagnetic interference measurement accuracy and repeatability with a displayed average noise level (DANL) of -163 dBm at 1 GHz, representing excellent input sensitivity to reduce the effects of electrical noise. The MXE EMI receivers are fully compliant with CISPR 16-1-1 2010, the International Electrotechnical Commission recommendation that covers measurement receivers used to test conducted and radiated electromagnetic compatibility (EMC) of electrical and electronic devices. Offering excellent measurement accuracy of ±0.78 dB, the MXE exceeds CISPR 16-1-1 2010 requirements. Agilent's X-Series is an evolutionary approach to signal analysis that spans instruments, measurements and software, providing the flexibility to address business and technical requirements across multiple products and programs. The X-Series also provides a consistent framework for signal analysis, enabling teams and their projects to move at a faster pace. In addition to the new MXE EMI measurement receivers, the X-Series includes the high-end PXA, mid-range MXA, economy-class EXA and low-cost CXA as well as more than 25 industry-leading measurement applications. Guy Séné, vice president and general manager of Agilent's Microwave and Communications Division comments that the ability of MXE to move seamlessly between EMI receiver and signal analyser modes can help test labs expand their service offerings beyond compliance testing.